Now some might think I have a slight shoe problem but I tend to dissagree. I love shoes and try not buy any that won't work with my wardrobe and lifestyle!! That doesn't always work, I have a pair of 4" almost 5" Nine West gladiator heels that I have worn twice but they were so fun I couldn't leave them behind!!!! I went shopping last week with my handy list in tow. I was searching for a great transition dress from winter to spring and a blazer. I came home with a tunic, a pair of wool shorts and two pairs of ballet flats from Old Navy!!! I even shocked myself when I left Old Navy with nothing but two pairs of shoes! Not usually my first choice for shoes but they were just so cute and such a great price!!! 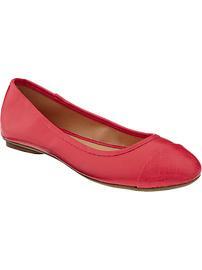 This red/orange shoe is a perfect pop of colour to add to any outfit! This shoe I purchase with a bright royal blue toe instead of the yellow for a little taste of spring! If it would just stop snowing, I could wear these great new shoe purchases! !